Learn About the Curry Honda Atlanta Repair Center - View our Menu, Schedule an Appointment & More! Curry Honda proudly offers Express Service to give our customers even more flexibility and convenience. Our factory-trained Honda technicians in our state-of-the-art facility have the training and resources to service your vehicle more quickly than ever. Check out the different services we offer for Express Service below! Read more about express service here! Thank you for visiting Curry Honda's site and welcome to our service department page! I just wanted to take a brief moment to tell you that we are here to help you with any of your parts or service needs, such as oil changes and brake repairs. We're committed to providing the best service possible every time that you visit. Please stop by and visit me when you get a chance and feel free to ask any questions that you would like! 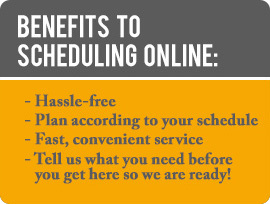 For even more convenience, Curry Honda is proud to offer you the option to schedule your next Honda service online! Simply fill out our online form (or call 888-221-8441) to get the process started! Following you submission, we'll respond to you promptly via your preferred contact method, ask any additional questions required to service your vehicle and confirm your appointment! We match all Honda Dealer's Coupons! We will meet or beat any tire price!